I remember watching this race live on television, as Jacky, in protest against the safety implications of the famous 'run and jump start', strolled across to his Ford GT40. 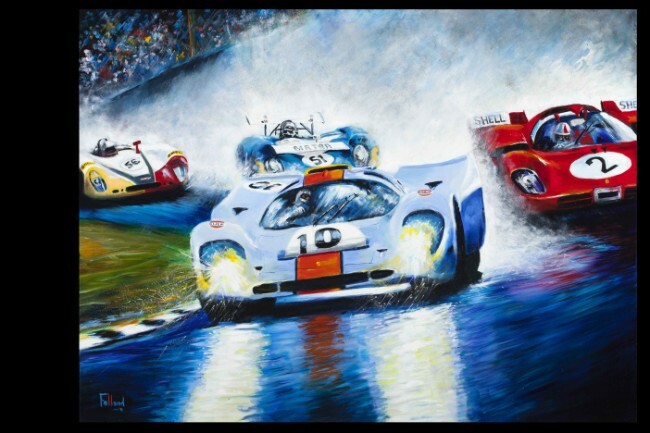 The mighty Porsche 917s, although easily the fastest, also proved fragile. For the last couple of hours, Ickx fought with the Porsche 908 of Hans Herrmann, with the lead swapping several times a lap. The unfancied GT40 pulled it off! 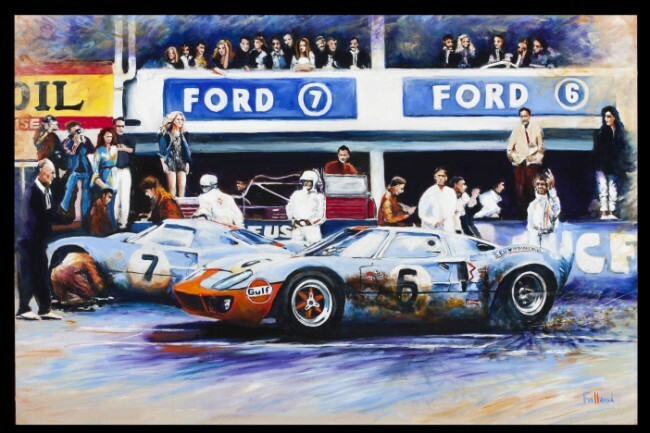 "Ragged Glory", features the battle-scarred GT40 emerging from the pits towards the close of the race. "Nobody told Pedro it was raining!" sees 'rainmaster' Pedro Rodriguez displaying his immense wet weather skills at the Brands Hatch one thousand kilometre race in 1970. Being forced to pull into the pits by the Clerk of the Course for dangerous driving was just the incentive for Pedro to produce his virtuoso drive, as he stormed out of the pits. The entire field was lapped five times!